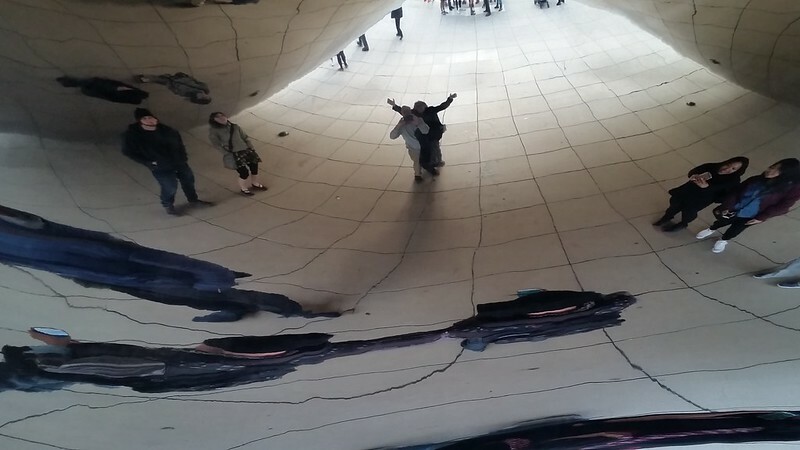 We bonded with The Bean and want one for Atlanta. It's a people attractor that belongs to your eye, personal and infinite, a giant fun-house mirror, interactive without electronics, every view different, democratic free fine art, and it makes makes you look thin. "Cloud Gate" by Anish Kapoor. We want one. Where to put it? I'll get to that in a sec. Your suggestions welcome. Pretty much love at first sight. I'd seen pictures, read a little. The urbanists, public space lovers, and others were all agog. But I didn't get it. Now I'm total agog. In nearby squares there's a giant Calder, a huge Picasso, and a colossal Chagall mosaic. I love them but they just sit there. We had the stiffest legs from driving to Chicago for a wedding. We checked into the W Chicago - City Center and figured we'd go for a walk and get some dinner. We headed east toward the lake to Michigan Avenue and The Art Institute of Chicago. 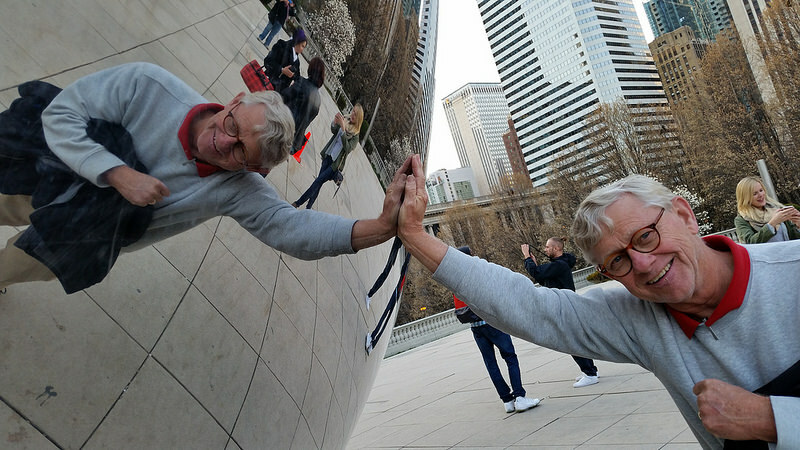 I knew the Bean was over there somewhere. We went east on Adams and got to Michigan but couldn't see the Bean so I scouted ahead. "Here it is," I signaled to JoAnn. 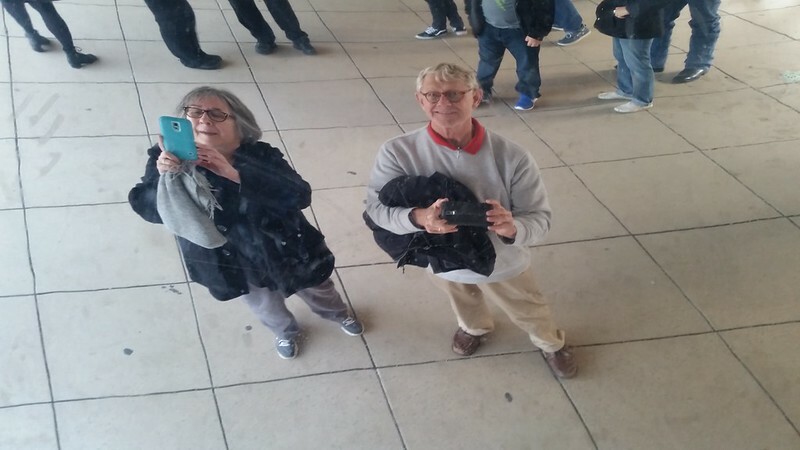 Our first under-Bean selfie, see JoAnn behind me with raised arms? It feels non-Newtonian under there. You just can't grok it in a still picture. Where should we put Atlanta's bean? Should we put it into a great public space or can use to make a great public space? Piedmont Park across 10th street from Grady Stadium. Piedmont Park is Atlanta's greatest public space and serves as a BeltLine destination. High Museum where the Rodan is. The Woodruff Art Center's Sifly Piazza is wonderful once you are up there but it doesn't "show" on the street. It needs a come-hither feature. The proposed Buckhead over-400-park. Buckhead is trying to make a people-attracting city center and needs it so much. Decatur Square where the bandstand is. Downtown Decatur is already a great family friendly public space. Centennial Olympic Park so you can catch it on the way to the Aquarium, the Hall of Fame, Civil Rights museum, the World of Coke. Not my preference but tourists would remember it. Woodruff Park needs something to attract smiles. The waterfall calms. The Bean energizes. Maybe put the Bean in front of the waterfall? Sweet Auburn. We've expended so much effort to make it a great space fitting it's stature. I don't think a Bean could do it. But Edgewood desperately needs a terminated vista, a come-hither landmark. Tech Square on the southwest corner where Fifth Street T-bones West Peachtree. Important note: "...with the final figure standing at $23 million in 2006. No public funds were involved; all funding came from donations from individuals and corporations." - wiki. Maybe we can get a deal on the 2nd one. 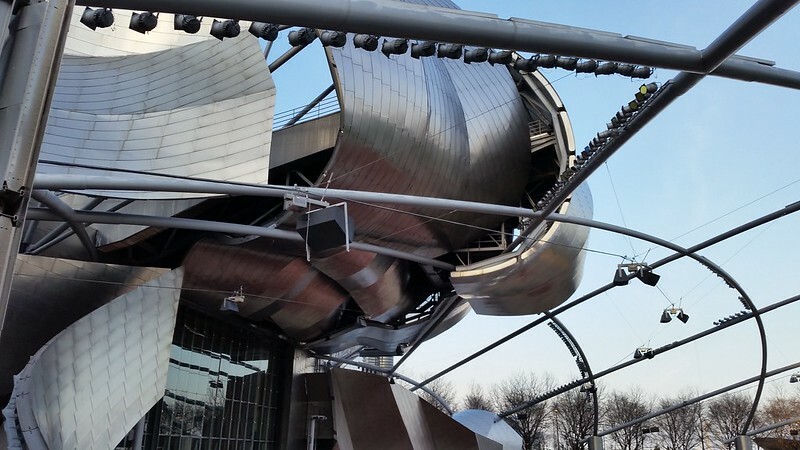 Bonus: from the Bean you can see the Frank Gehry designed Pritzker band-shell from the side.